I can't believe that it's Tuesday already! How fast the weekend goes by! It was a beautiful weekend here and a lot of time was spent outside. Well, kinda...when the Munchkin would let us. You see, the Munchkin has really bad eczema and right now he's dealing with a pretty bad flare up. So sun and heat exposure is making him quite uncomfortable and down right crabby, and regardless of how much sunscreen we put on him or how much we try to cover him up the sun is making his eczema worse. To make sure that he at least gets some fresh air we've been having balcony picnics and playtime throughout the day and I've been taking him out around dinner time, when the sun isn't hot enough to make him a miserable toddler. On Saturday there was a big exception. Since the James Bay Community Market is literally right outside our front door, we decided to take advantage of the live music, the kids tent (which the Munchkin absolutely loves! ), and...the major tent action throughout the entire market. Yay for coverage from the sun! The hardest part of it all is trying to get the Munchkin to go back home for nap time. Most people I know think he's too old to have a nap or that skipping a nap here and there won't do any damage. Well, trust me when I say that the Munchkin needs his naps. If he doesn't have one he becomes quite the grumpy terror! I'm talking tantrums galore where everything and anything can set them off. Believe me, it's not worth it to let him skip/end his naps!! Anyhoo, ever since the market opened up in May I've been meaning to look for homemade jams but for some reason never got around to doing so. I think it's because the market is open every Saturday until October and I figured I would have plenty of time to get jam. Then a few weeks ago I noticed a stall selling nothing but jams. I immediately recognized the stall set-up and got excited. At Christmas I went to a craft fair and had bought some amazing Blueberry Cherry Jam from Whimsical Preserves (sorry, they don't have a website) and had wished I had bought more than one jar. So when I saw their stall you better believed that I high-tailed it over there and got some! I also picked up a jar of peach jam cause I love homemade jams that have chunks of fruit, and boy, this jam did not disappoint! I'm going to have to remember to pick up some more before the market closes for the season. Not that I'll forget...it's only been 3 days since I bought these jars and already one of them is half empty!! I definitely must learn how to make my own jam...and fast! 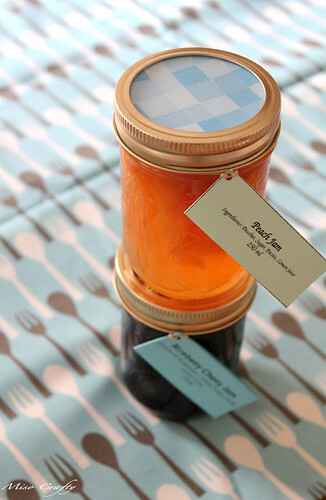 If you're in the area, you should definitely hunt down Whimsical Preserves and give their jams and chutneys a try. They're so yummy!! On a non-jam related note: a little bit of knitting did happen over the weekend. Sadly, there was also a lot of un-knitting going on too. I kinda don't want to talk about it cause it makes me a little mad, but basically I picked up a project started months ago and was determined to get it finished by the time the weekend was over. I underestimated how much yarn I had left and tried to keep going and now I've run out. I tinked back and tried to bind off, only to discover that the recommended bind off uses a helluva lot of yarn. I was a quarter away from the end when I ran out of yarn. Again. I seriously want to rip out my needles and drop kick this project as far as I can. I should really take a step back and take a breather, but I really want to get this project done. Cause I'm done with it. I'm hoping the next time I talk about this project it'll be an FO post. Or it'll go back to being a ball of yarn. Shoved into the darkest corner of my closet. One bind-off that doesn't use a lot of yarn involves just going up a couple of needle sizes and binding off the normal way - knit 2 pass the first st over the second. *Knit 1, pass the first st over the second. Repeat from. It worked for me when I knew I was going to run out of yarn and I needed a stretchy bind-off. Another technique I've used is casting off purlwise in the row the bind-off row (assuming you are knitting stocking stitch). Oops! Last sentence of my previous message's first paragraph should read. "Repeat from *". Also, the last paragraph should read, "Another technique I've used is casting off purlwise in the row before the bind-off row (assuming you are knitting stocking stitch)". 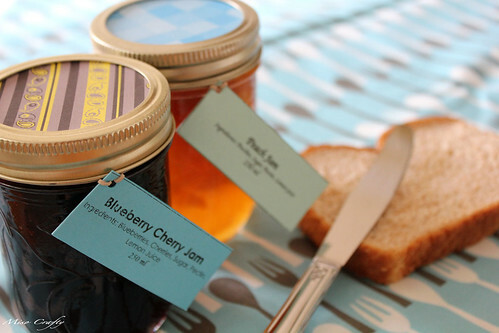 I really want to try and make some homemade jam. I am hoping we can get to the strawberry farm before the season ends so I can pick my own strawberries then make jam from them.